I will sing hymns to your name, Most High." As we celebrate Thanksgiving with family and friends and enter the Advent and Christmas liturgical seasons, let’s remember and thank God for all He has provided us. We give thanks to God for grace He gives each one of us. We give thanks to God for loving families, caring friends, and welcoming homes in a country that values gratitude, generosity, and service to one another. 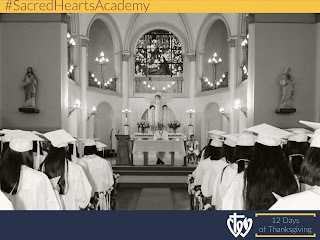 We give thanks to God for the gift of Catholic education, especially for Sacred Hearts Academy and the mission of the Congregation of the Sisters of the Sacred Hearts of Jesus and Mary. We give thanks to God for our vocation of teaching God’s children alongside all of our colleagues, an amazing team of dedicated educators and administrators who work together to help our students grow closer to Him. We wish safe travels for all who are going to see loved ones near and far over the long weekend. And we leave our Academy 'ohana with this prayer of Thanksgiving. Have a truly blessed weekend. Father, all powerful,Your gifts of love are countlessAnd your goodness infinite;As we we come before you on Thanksgiving DayWith gratitude for your kindness,Open our hearts to have concernFor every man, woman, and child,So that we may share your gifts in loving service.Through our Lord Jesus Christ your Son,Who lives and reigns with you in the unity of the Holy Spirit,One God, for ever and ever. Amen.